Wait a minute.......Isn't the water supposed to come out of the yellow thing? Off topic. That's a strange looking fire-plug. What city is this? As to the fireplug, it looks normal to me... Appears to be a Rensselaer. Looks like there might be some sort of a gearing mechanism in the top of that Hydrant, judging by the shape of the top part. Possibly, this could be to turn it on quicker than a direct drive spindle. Could one of the FF's here please explain why there are two sizes of couplings on that Hydrant?. The larger one looks like a standard Feeder size, what is the smaller one for?. You're lucky you can see the fittings to ask questions. All the fire hydrants in Britain are located under the pavement, accessed by lifting a cover plate. There is then a yellow marker sign at the side of the road to show locations. The 2 types of connections are refered to as steamer and 2 1/2 most places use the steamer, usually 5" connection because of ease of use, amount of flow and less friction loss (resistance) as for the type of hydrant it might be a dry type which means there is a stem from the top of the hydrant down to the H20 main as to prevent freezing. in warmer places the use a hydrant like you see in the movies and this picture when someone runs it over the water shoots out... there is water up to street level. Later they came up with the new hydrants. (ie multiple sizes). 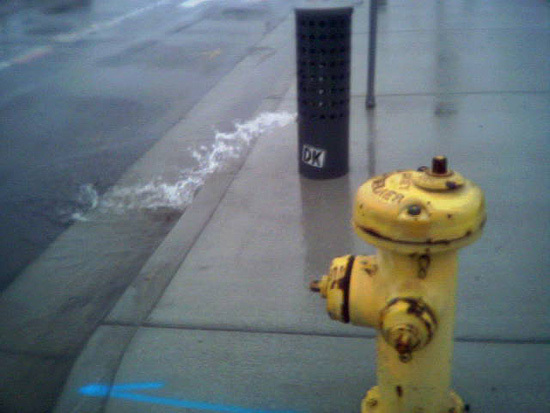 I think they call that a "dry barrel" hydrant, common in very cold places > also common in the desert for some reason ??? ?